31	100 % of buyers enjoyed this product! It is not only a light bulb! 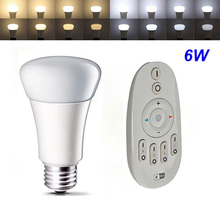 Light bulb & speaker – Combine multicolored LED Light Bulb and Wireless Bluetooth Speaker into one product. Use cutting-edge lighting and audio technology to bring you wonderful lighting and music experience. Color change – up to 16 million colors and 4 color effects to be chosen via PLAYBULB X APP. You can also shake phone to change color or add new picture into APP and let the light bulb display the picture colors. Music play – Built-in advanced speaker to play your phone music, broadcast, movie etc. Set a sleep timer, lay onto bed and go into sleep together with music and light fading out. 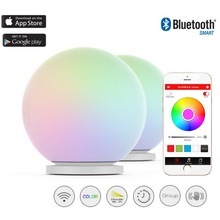 Set wake up timer, get up together with the colorful light and soft music. 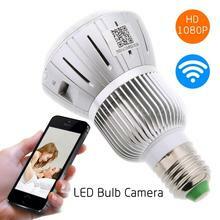 As all we know, LED light bulb or Bluetooth speaker is not novel any more. 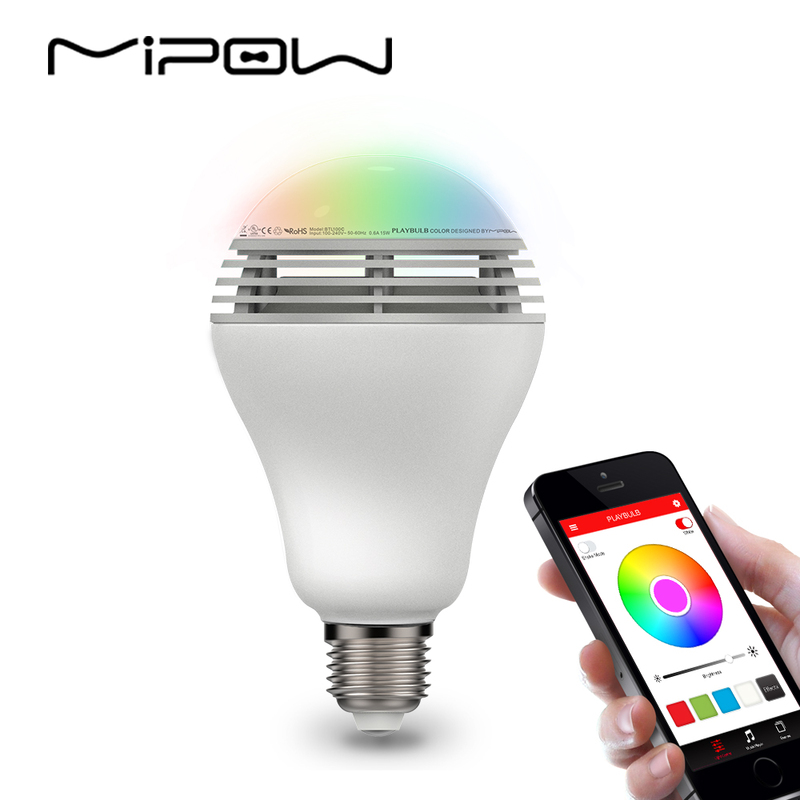 MIPOW PLAYBULB color will bring you a new perspective. 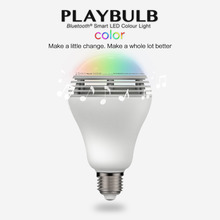 PLAYBULB color is a LED color-changing light bulb, but also a Bluetooth smart speaker. It takes with traditional light bulb shape, but embedded speaker inside. With its colorful light and music, tango with your girl or dance the samba with her. Romantic mood light up! Cook a tasteful dinner with him, play your favorite song! Read a book and listen to the music with her in the cozy sofa. March 14, 2016 Шикарное качество. Но огромнейшая проблема с работой устройства через мобильный телефон. Большинство телефонов не поддерживают программу контроля. March 14, 2016 Great product! March 14, 2016 Un mes en llegar. El producto es de altísima calidad. Volvería a comprarlo de ser necesario. El vendedor fue gentil y responsable. Baje la app y me parece que no está de acorde a la calidad de este producto, pero es buena de todos modos. Sólo que me costó conectar la música a ni galaxy S4. March 14, 2016 Works great! original package and all , thank you! March 12, 2016 Спасибо продавцу! Все пришло быстро. Упаковано качественно. С настройкой проблем не возникло. Остался очень доволен. Повторно разместил заказ. Одной лампы для создания сценария мало. March 12, 2016 quick delivery and nice product. February 25, 2016 Классная лампа! Получили массу удовольствия ))) звук, правда, не особо громкий и чистый, но всё равно прикольно. February 18, 2016 Классная штука )) Все аккуратно запаковано. Быстрая доставка. Рекомендую. February 18, 2016 Awesome thing! February 18, 2016 Perfecto. Me ha gustado lo facil que se ha emparejado con el telefono, y lo intuitiva que es la aplicacion. El sonido que tiene me ha sorprendido gratamente, se oye muy bien y con un buen volumen. Tambien es de agradecer que la aplicacion este en el Play Store, por las actualizaciones que pueda llegar a tener. Envio muy rapido, solo 20 dias desde la compra. 5 Estrellas para el vendedor. Perfect. I liked how easy it is paired with the phone, and the application is intuitive. The sound that has surprised me pleasantly, you hear very well and with good volume. It is also appreciated that the application is in the Play Store, updates you can ever have. Very fast shipping, just 20 days after purchase. 5 Star for the seller. February 18, 2016 Amazing! Very good quality! January 14, 2016 Excellent product. Fast delivery. Will buy again, if I get the same price. December 16, 2015 Great product and highly recommended seller! November 30, 2015 product is not as usefull as I expected but delivery was good. November 25, 2015 Fast shipping. Had issue with operation of bulb, seller was quite helpful with directions that are not included in the packaging. 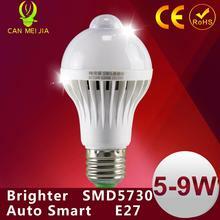 Also, had issue with a faulty bulb, seller was extremely fast replacing this product. I will absolutely do business again with this seller. This is how business should be done, fast, accurate, and helpful. Thanks.